We shot both video footage and still photographs for the Beauty Box examples. Because of the video, we needed continuous lights. 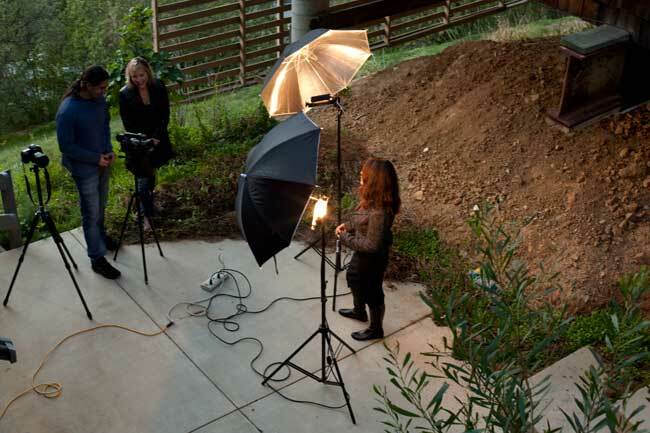 We used two 750W Lowel Totas for main and fill lights, a Lowel Pro for the hair light, and a 32″ reflector. For the photos, we added a Canon 580EX flash and used a Canon 5D. We used the Canon 5D Mark II to shoot the HD video and a Panasonic DVX100 for the SD footage. Outside with our model, just before the SF weather turned from 70 to 60 degrees. Previous PostWhy 3D TV Is A GimmickNext PostSuper-charged plugins, that’s us!